Upscale seclusion with accessibility to the best of the North Shore's assets, our Anini vacation rentals are the place to stay that will meet a variety of vacationers' interests and needs. Beaches, challenging golf, and dreamlike views at every turn make Anini, in Kilauea, an indulgent stay. Anini Beach (Wanini until the first letter fell off the sign years ago) is best known for its reef, which is the largest in Hawaii and shelters the beach. Guest of our Anini beach rentals find this beach ideal for spending a day of gentle swimming, snorkeling, and windsurfing. Once on the North Shore, visitors can travel to the northernmost point possible (of the six islands), which is Kilauea Lighthouse, listed on both the State and National Registers of Historic Places. The lighthouse had the largest lens, later replaced with a low-maintenance light beacon. The lighthouse sits on a cliff, which allows for incredible photo opportunities plus bird watching. A perfect day trip continues with Kilauea Point National Wildlife Refuge, with more native birds and Hawaiian monk seal, and exploration of Crater Hill, an extinct volcano, and Mokolea Point. Na Aina Kai Botanical Gardens in Kilauea extends the outdoor experience with tours (stroll or ride in an open-air vehicle) of its tropical plants and sculptures, more than 240 acres on a plantation, in a meadow, aside a lagoon. History and nature blend beautifully with stories of the island's first settlers through rare flora. Activities range from whale watching to a walk in a Japanese cemetery in Kilauea, something for all interests. Nearby Princeville is the site of world-class golf with courses reminiscent of those in Scotland, with distinct design highlighting the Pacific backdrop. 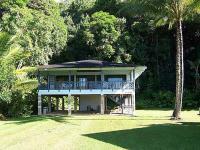 Staying in a Anini beach rental presents accessibility to sights and beaches in Hanalei as well as Princeville. North Shore restaurants offer a variety of cuisines and atmosphere, from the fish taco trucks at Anini beach to upscale seaside spots. Similar to taking in the sights of this area of Kauai, the variety of dining opportunities are excellent with nearby Princeville and Hanalei. Island apparel, fresh tropical fruit, furniture, artwork, and antiques are available in Kilauea with more shopping centers in Princeville and Hanalei. Kong Lung Historic Market Center offers treasures to buy and see. Listed on the Hawaiian and National registers of historic places, it was once a company store; today, it houses a myriad of eclectic boutiques and eateries.